Shop the best travel jewelry display cases & transport your pieces in style! Showcasing has never been easier - even when your traveling! 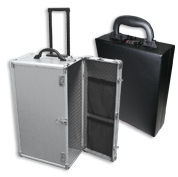 Get the best carrying cases with trays or suitcases and boost your sales. Portable display cases made of wood, leatherette, aluminum or black velvet, for all your precious items & at discount wholesale prices!